Dave has had a life long fascination with the drums which has exploded over the years to where it is now. He’s an active player with nearly twenty years gigging experience and a self confessed gear head. The first thing that people find out about him is that he’s a drummer before anything else and few conversations go by without mentioning drums. 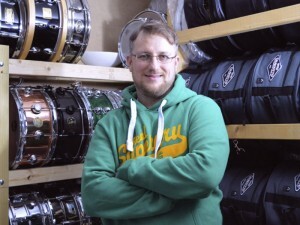 He has been a rather obsessive collector of snare drums and cymbals for the last twelve years with ‘the collection’ extending to nearly a hundred high end snares, including nearly two dozen Craviottos, vintage and other popular boutique models and over a hundred and fifteen cymbals. And then theres all the kits and electronics… acoustic kits galore and one somewhat extended electronic setup that lives in the drum room at the end of his garden. There is indeed enough for a small shop. He’s currently playing in a number of cover bands around London and the Home Counties as his delusions of fame, money and grandieur are long gone.